Here are our plans for learning during the Dormition Fast. I have crafted a calendar in the style of Advent calendars. This Dormition calendar has the theme of “Flowers for the Theotokos”. On August 1st, the calendar will only have an icon of the Mother of God and a vine. Each day of the fast, we will read a selection from Scripture, the majority of which will trace the types of the Theotokos in the Old Testament. I know others, most notably Mary at Evlogia, have done this in the past, and I thank them for their inspiration! Rather than choosing a symbol from each reading this time around, we will just stick with offering a flower to the Theotokos each day. As the garden is filled, we’ll count down the days until the Feast of Dormition. The Dormition Calendar idea has lots of potential. Many different materials could be used to make your own calendar. Some of the above readings are long and not the kid-friendliest. Perhaps for the youngest crowd, you could tell the story verbally as they attach the flower each day. Older kids, however, could dig even deeper by exploring the hymnography to Mary, especially the Akathist Hymn and the Supplicatory Canon to the Mother of God (Paraclesis). 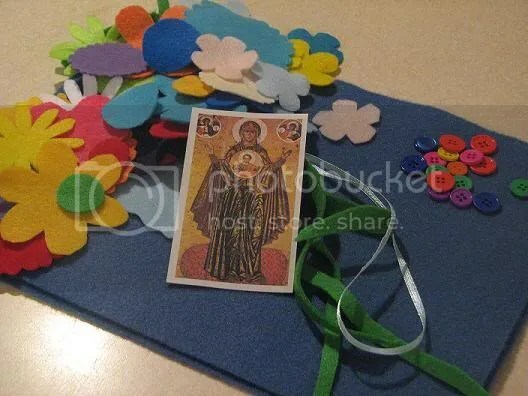 If you aren’t crafty or you just don’t have time to gather supplies, I am selling felt kits to make the Dormition Calendar for $7.50 plus $2.50 shipping and handling. 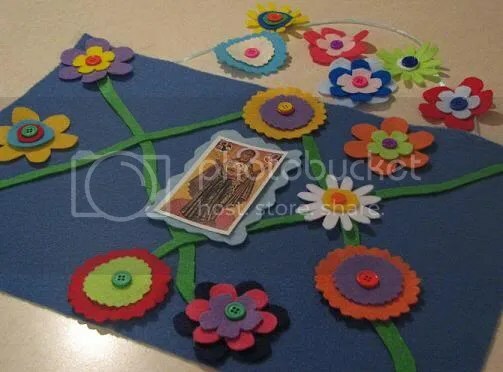 Included: background and vine material, pre-cut flowers, paper icon, buttons, and ribbon for hanging. All you have to add is glue and kids! Colors may vary from sample. You are welcome to choose a color scheme for your flowers. Choose from brights (as pictured in sample), primary colors, or your favorite color combo. Maybe Pinks & Yellows? Maybe White & Accents? Ask me!!! I know it’s short notice, but e-mail me right away at craftycontemplative@gmail.com. I’ll ship ASAP. love this idea – how pretty! 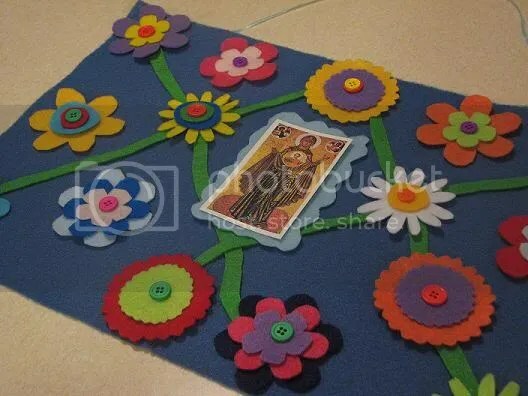 I love this idea, but as I was short on time, I did it with paper – a drawing of a bush taped to the wall under an icon of the Theotokos, and every day we tape on one paper blossom. Is it okay if I post pictures of mine on my blog. with a link to your much-cooler version as my original inspiration? Here goes! The pictures aren’t that good. I’m going to take more pictures in a few days as it fills up.